First introduced to jelly hearts by my girlfriend about two years back, these are so yummy and easy to make — I love them! 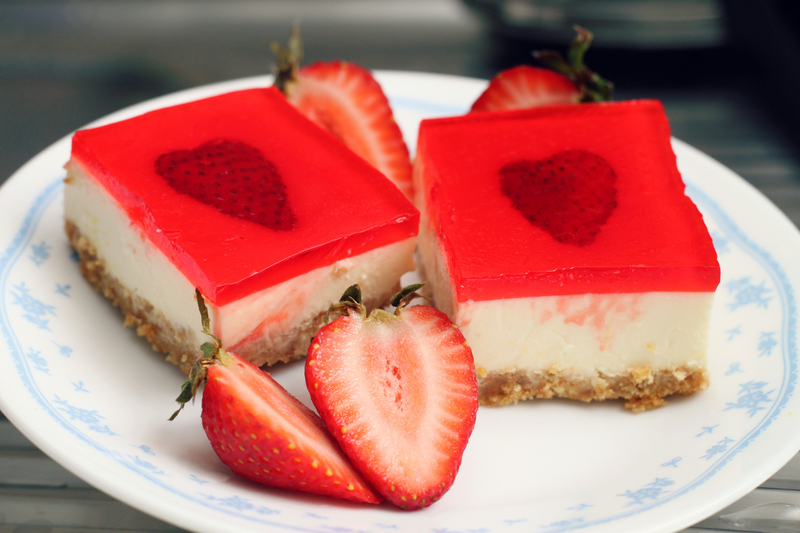 Cheesecake is my weakness (if you don’t already know), and who doesn’t love strawberries? 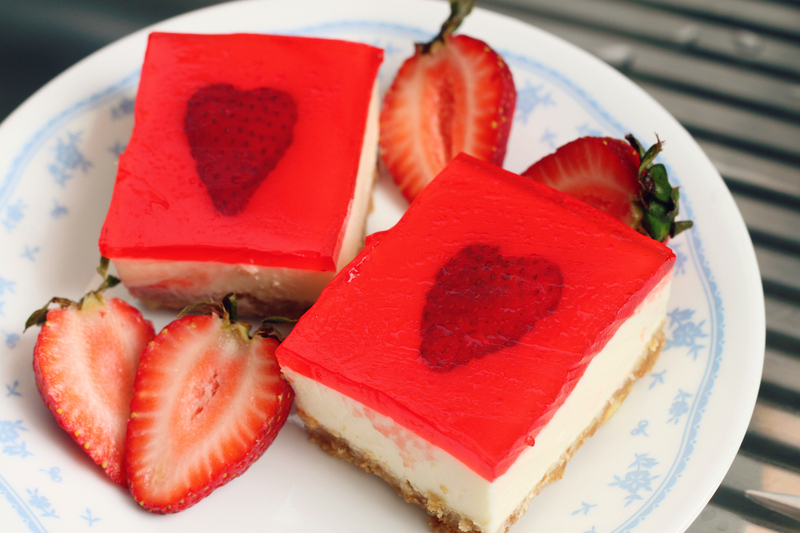 A good digestive biscuit base topped with some cold, flavoured jello… Mmm, makes for a good Valentine’s dessert as well. **Note: The pan I used was smaller than the one in the original recipe, yet I still used the same amount of cheese. If you’d like the cheesecake layer to be thinner, do adjust the ingredients accordingly. 1. Grease the bottom and sides of a large rectangular pan (I used a Pyrex glass 8 x 11.5 inch one). You may line the pan with parchment paper and grease the paper as well. 2. 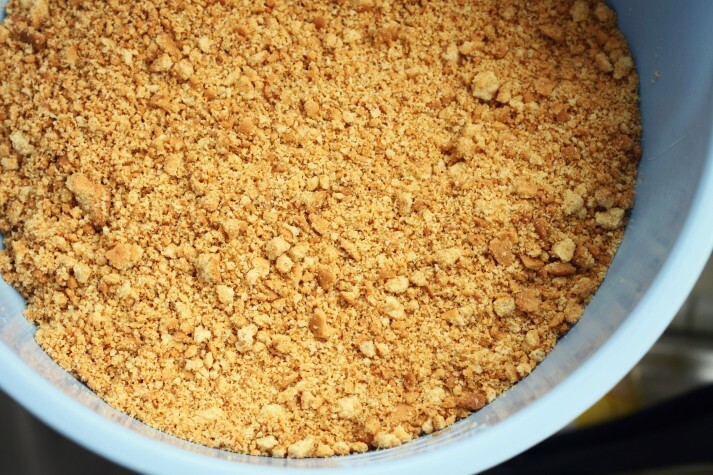 Place the biscuits in a food processor and pulse on high until they resemble fine crumbs as shown. Alternatively, you could also use a pounder to break up the biscuits. Transfer the crumbs to a large bowl. 3. Add the melted butter to the biscuit crumbs. Stir well to combine. 4. Place the mixture in the pan. Using a large glass with a flat surface, tightly pack the mixture into the pan to form the base. Transfer the pan to the refrigerator to chill. 1. In a small bowl, mix the gelatin powder and boiling water. Stir well until all the powder has dissolved. Set aside to cool. 2. 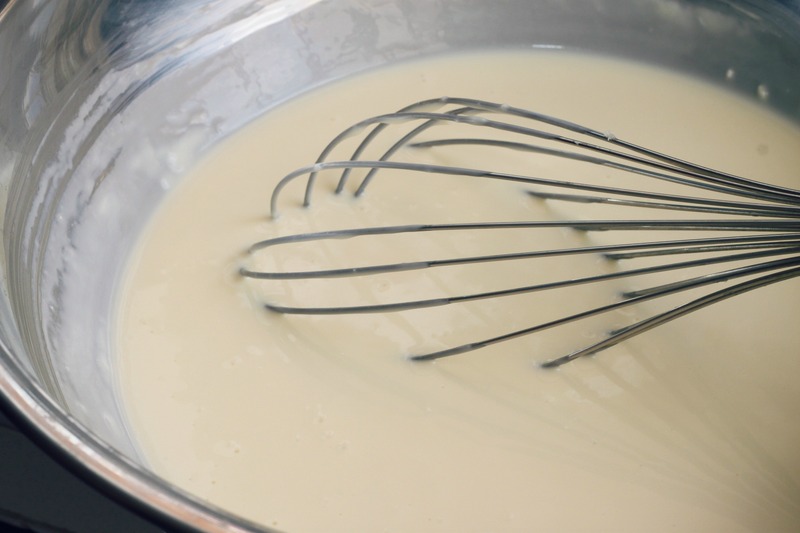 Using a stand mixer fit with a paddle attachment (I use a Kenwood stand mixer), beat the cream cheese and sugar on high speed until light and fluffy. 3. Add the vanilla extract to the mixture. Beat until just combined. 5. Remove the pan from the fridge. Using a fork, make holes all over the base. Pour the cream cheese mixture over the biscuit base. Allow to rest in room temperature for 10 to 15 minutes. 6. In the mean time, halve the strawberries lengthwise, making sure they are thick. 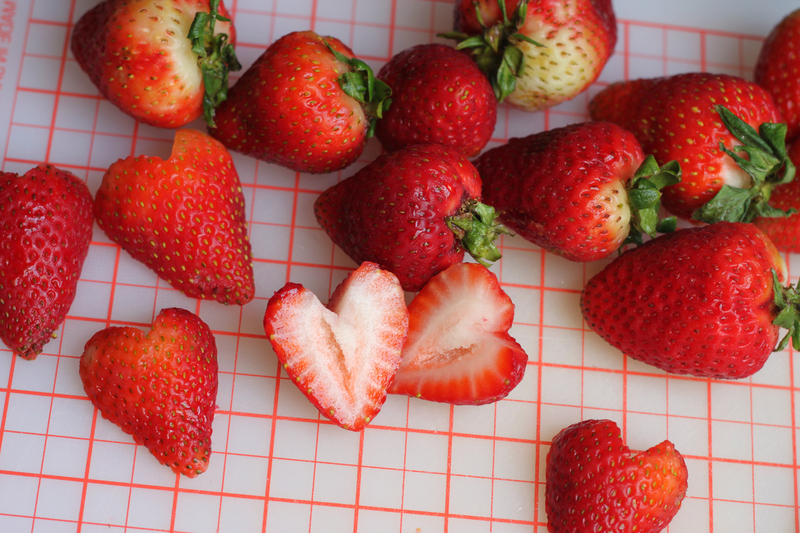 To make the heart-shape, slice off the white tops with the leaves and make a deep V in the centre of each half. 7. 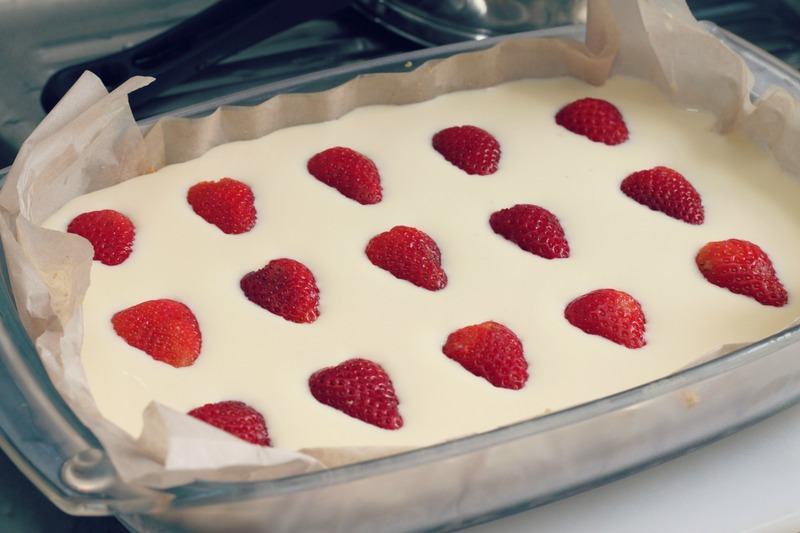 Place the strawberry halves into the cream cheese, spacing them an inch apart. Allow the strawberries to sink gently into the cream cheese. 8. Cover the pan with clear wrap and chill in the refrigerator for at least 4 hours (I did mine for seven). 1. In a medium-sized bowl, mix the jelly powder and boiling water. Stir well until all the powder has dissolved. Set aside to cool. 2. Once jelly mixture has cooled, pour it over the cream cheese layer. Pour just enough to cover the strawberries. 3. Cover the pan with clear wrap and chill in the refrigerator for another 4 hours (I did mine overnight).